It’s a hot Friday lunchtime in downtown St Petersburg, Florida – the heat bouncing off the city’s pavements in shimmering waves. 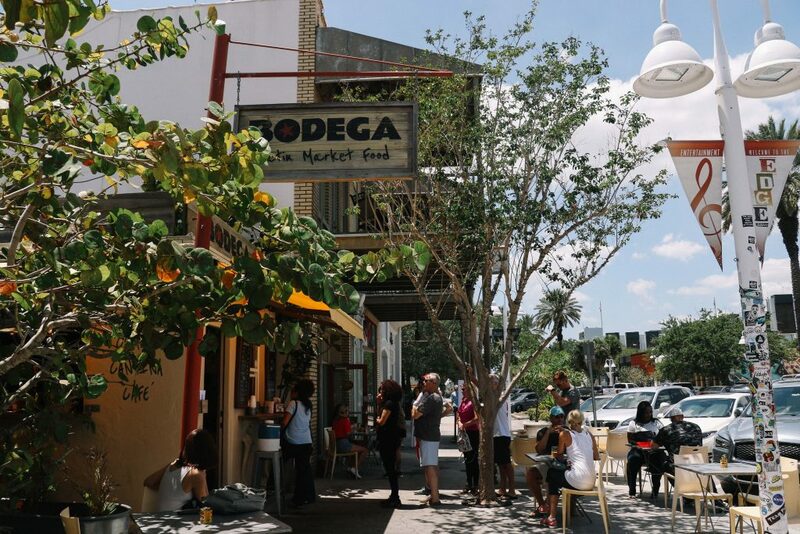 Sat under a towering Sea Grape plant, its leaves already wrapping their way around the building next door, we’re waiting for plates of Cuban food of our own, courtesy of St Pete’s beloved Bodega street-food restaurant. Accessed via a small hatch in a yellow wall, it’s here that Bodega’s food orders are taken and its mouth-watering dishes served. 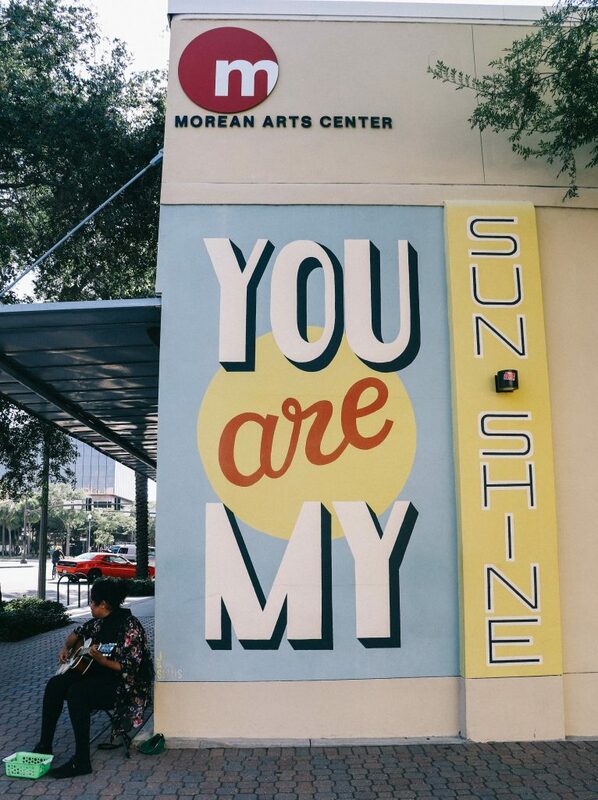 It’s a popular spot in the city’s downtown Edge District – a place where tourists, colleagues and residents gather for Cuban sandwiches, and plates of slow roasted mojo pork and sweet onions. It’s also the spot where new friends, Buddy and Nancy, are enjoying lunch. “I love the city so much that although I’ve been here six years, I rarely cross the bridge”, Nancy admits through a mouthful of food. “I just don’t see any reason to leave”. I eavesdrop shamelessly, listening as Buddy agrees. “There is no reason”, he shrugs. “St Pete has it all”. I sit back, intrigued. Having visited Tampa just a few days before, I’d expected my visit to St Pete, Florida to be much the same. After all, how different could two cities, less than a bay’s length apart, be? Were they really so fiercely different – so independent? Taking a final bite of my Cuban sandwich, I unfold my list for the best things to do in St Pete, Florida. I guess I’m about to find out. 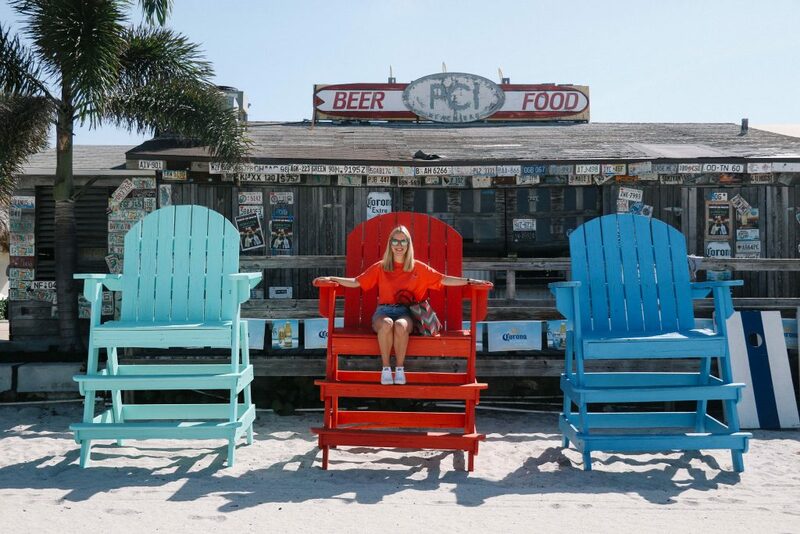 As our visit to St Pete was our third stop on our Florida road trip, we had made our way to the city from Crystal River – a smooth, two-hour journey southwards. However, for anyone intending to fly directly from the UK, the nearest international airport is in Tampa (predominantly served by London’s Gatwick airport). From here, it’s an easy 25-minute drive onwards: over the bridge and glittering Tampa Bay into downtown St Pete. Although St Pete does have its own airport, it’s important to note that it tends to cater only to domestic U.S. flights. 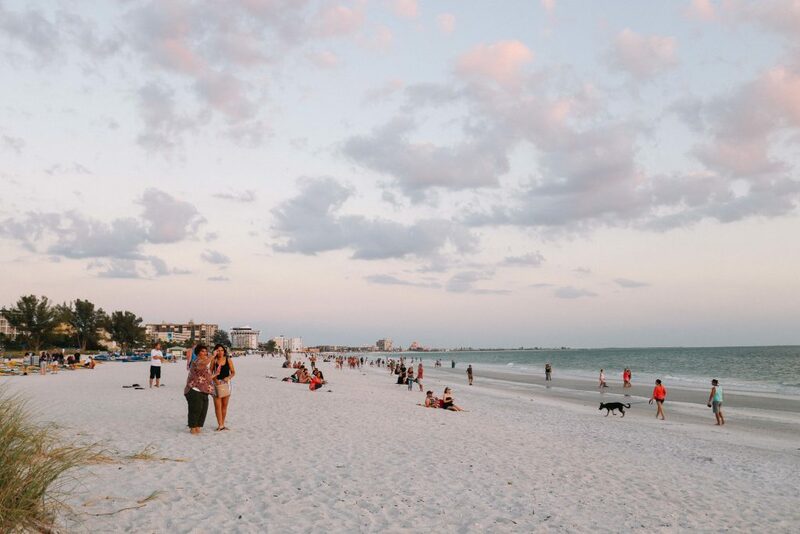 Our two nights in St Pete were to be spent beachside in St Pete Beach – one of the city’s many beach resorts and barrier islands. 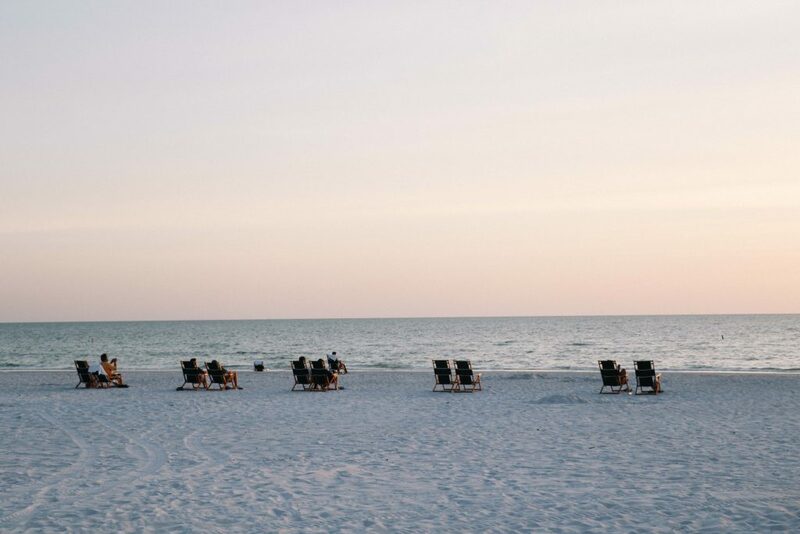 Indeed, whilst Tampa is bordered by the Hillsborough River and extensive Tampa Bay, St Pete and its neighbouring resorts are instead lapped by the warm waters of the Gulf of Mexico; their sugary soft sands the winners of multiple awards. 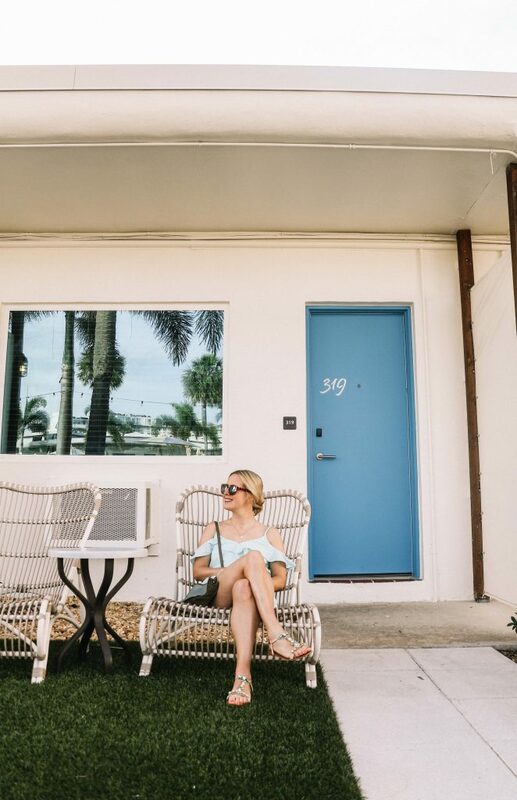 Our hotel for the night – a former seafront motel – was just a fifteen-minute drive from the city’s downtown area, based on the barrier island of St Pete Beach. 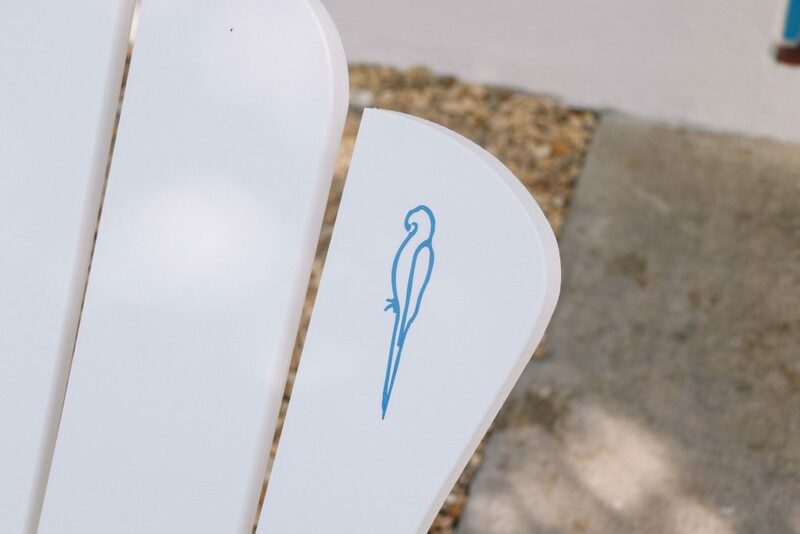 Incredibly styled and effortlessly laid back, The Postcard Inn on the Beach had left its motel days far behind, instead transforming into a surfer-chic, boutique hotel. Passing through the Inn’s lobby, one scented by coconut and bananas, we learnt that its former motel rooms had now been tastefully converted into individual cabanas. “No room is the same”, the receptionist promised as we checked in. Heading outside, we passed the hotel’s outdoor pool. It was framed by strings of glowing light bulbs and swaying palm trees; the neighbouring mango tree illuminated by glittering fairy lights. It all felt very Californian: a kitsch version of Palm Springs, perhaps. Inside and our room betrayed no signs that it was once a motel. Instead, the vast space was filled by two king-sized beds, an immaculate bathroom and a small kitchen area. Painted a dazzling white, with fresh cotton bedding and artwork from local artists, the room felt more like a miniature beach house than a hotel room. Moving over to the window, I lifted the shutters and watched as the sky turned a blushing pink – one of St Pete’s infamous sunsets on the horizon. It seemed the perfect introduction to this easygoing city, and a fantastic place to witness our first candy floss sunset. With evening now settling across St Pete Beach – a warm breeze blowing down Gulf Boulevard – we left our hotel in search of one of the area’s most iconic buildings: The Don CeSar Hotel. 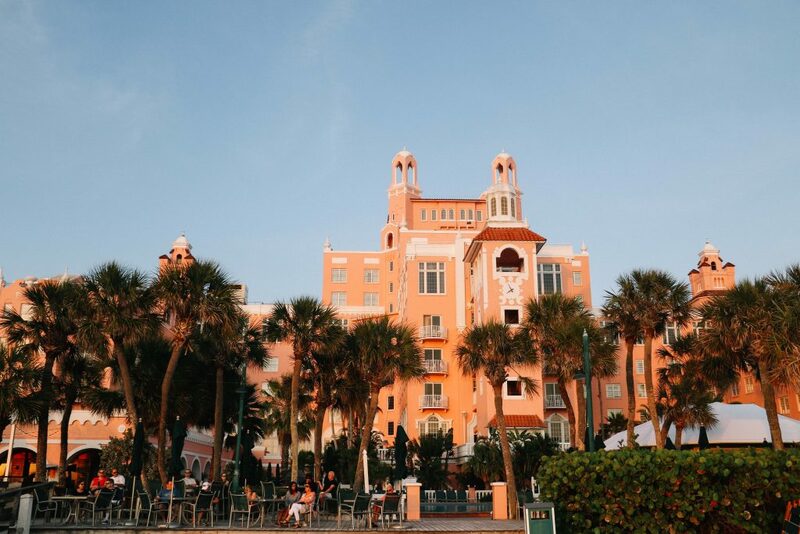 St Pete Beach’s very own Great Gatsby, The Don CeSar Hotel is the epitome of Florida’s roaring twenties: a time when pink palaces were built for lost loves and writers such as F. Fitzgerald Scott stayed in beachfront rooms, surrounded by stars of the silver screen. It’s also one of the best things to experience and do in St Pete, Florida. Opened in 1928, the ‘pink palace’ was the architectural triumph of Thomas Rowe, who built the hotel in memory of his lost love, Lucinda. Frequented by gangsters, singers, actors, writers, politicians, veterans and sportsmen, The Don CeSar Hotel has a long and glittering history; its Grand Ballroom the spot where Sinatra and Presley once serenaded champagne-sipping guests. Today, the hotel’s magic remains. 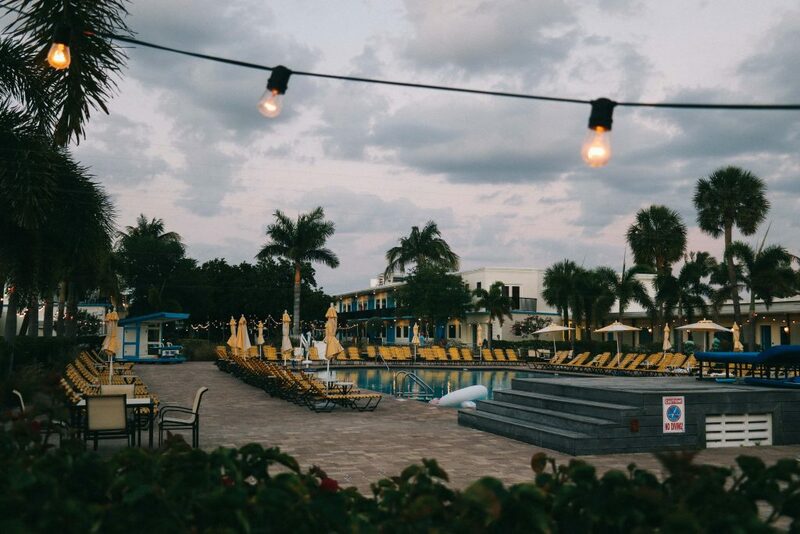 Arriving at the towering pink building – its symmetry of almost Wes Anderson proportions – we met with Kayla, Marketing Manager for the hotel, who led us to the Rowe Bar for sunset dinner and drinks. The hotel’s newest beachfront bar, this outdoor area offers a more relaxed atmosphere than perhaps some of the hotel’s finer restaurants – a place where beach goers can sip cocktails with sand-covered dogs at their feet. Settling down in front of a roaring fire pit – a glass of prosecco each in hand – we watched as the sun ebbed slowly downwards; the beach now gilded gold. As Kayla told us stories of the hotel’s mysterious and glittering history – stories of heartbroken ghosts, spectacular weddings, returning servicemen and infamous film sets – I began to realise how different Tampa and St Pete (its beaches included) perhaps were. Whilst Tampa was filled with an almost hyperactive zeal to transform and innovate, St Pete seemed its more laid-back cousin; a place happy to indulge in its romantic history over a cocktail or two. Although change is certainly happening – the bohemian Postcard Inn and Don CeSar’s newly renovated Beach Suites a testament to this – it comes at a gentler pace. One that allows for a Piña Colada or two in-between any disruptions. As we left – passing through the hotel’s marbled lobby – I made a mental note to return to this candy-hued palace. For those hoping to experience a sense of bygone decadence, with beach views and experimental cocktails ever on hand, then the Don CeSar Hotel is most definitely the place to stay in St Pete, Florida. Opening the blinds the next morning, we were met with yet another sun drenched day – St Pete’s unofficial title as the ‘sunshine city’ evidently not just a marketing ploy. 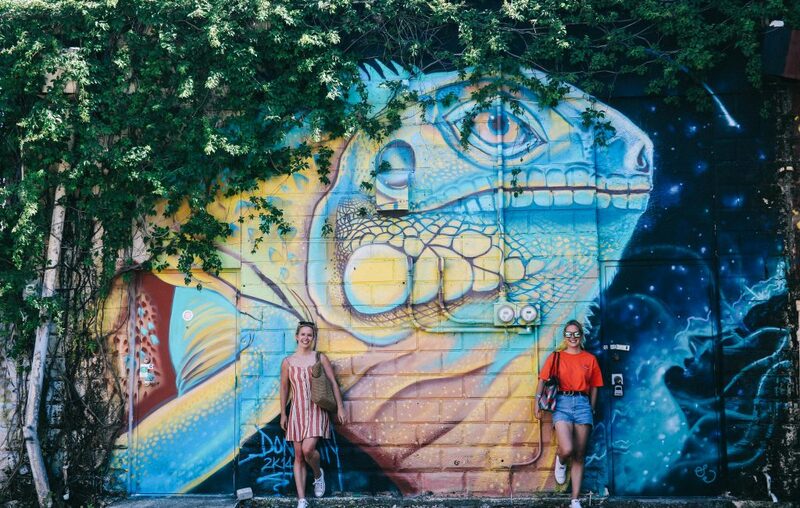 Whilst our short time in St Pete so far had introduced us to the city’s more laid-back, beachfront side – today we’d been experiencing the city from new angles: exploring its water activities, its museums and soaking up its vibrant downtown energy. In short, we’d be experiencing the best things that St Pete had to offer. Hurtling across the Gulf of Mexico, Claire’s hand shifting the accelerator ever faster, I leaned in as she shouted over the sound of the roaring engine. 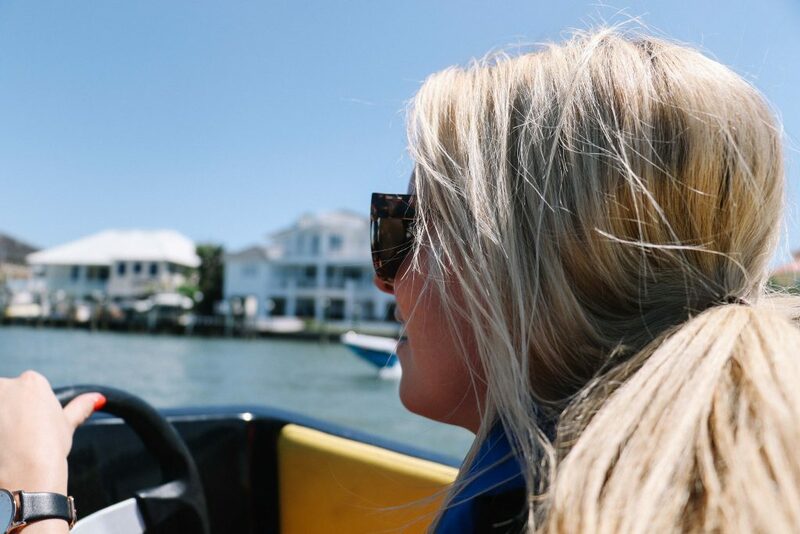 “Are we going too fast?”, she yelled, our speedboat racing past rows of waterfront mansions. Trying to smooth back my hair – which had now almost trebled in size – I shook my head, bravely. “No, we’re OK”, I replied. “Good,” she shouted back, before pushing the accelerator ever faster. We bounced over the next set of waves like a scene from a James Bond movie: Claire’s smile now even bigger, my mouth set in a clenched grimace. Just an hour before, we had arrived at St Pete Speed Boat Adventures, based on Passe a Grille Way. Offering visitors the opportunity to drive ‘mini’ speedboats of their own, this was certainly a level up from my normal walking tours. Led by our tour guide Ben, we would be let loose on the Gulf’s shimmering waters, weaving behind him as he sped ahead. “If you don’t see a dolphin, I’ll eat my hat”, Ben promised as we left the harbour. I noted that he wasn’t wearing one. Five minutes later, however, and Ben instructed us to cut our engines, pointing to flurry of activity next to our boat. Sure enough, a small pod of dolphins were swimming nonchalantly past – their fins almost within touching distance. Ben looked triumphant. Over the course of the next hour, we’d not only continue to see more dolphins, but sea turtles, rare sea birds and the beloved manatee, too. Interspersed by periods of flying heroically over waves, it was perhaps one of the most exhilarating (and mildly terrifying) tours I’d ever taken. We completed our trip by heading towards a floating platform: a man selling clams and beer from his onboard store. Around him, couples and families reclined in their boats, each clutching plates of fresh clams and lemon; their ice-cold beers balanced next to them. “Welcome to St Pete on the Water”, our guide said, laughing. Bobbing quietly next to the other guests, it was a version of St Pete that was impossible not to enjoy. For those who have St Pete, Florida marked as a destination only for beach bums and sun seekers, then you’d be wrong. 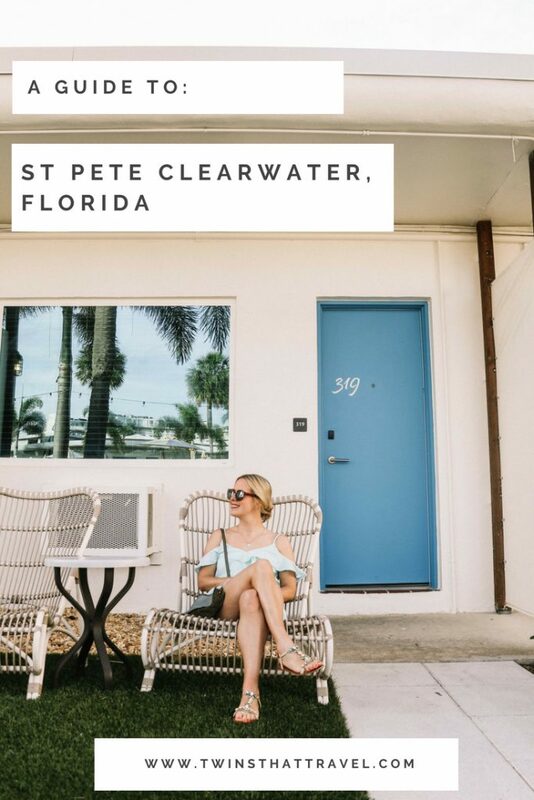 Whilst St Pete Beach and surrounding Clearwater are undeniably beautiful – attracting thousands of visitors a year – the city itself harbours another side: it is something of an art aficionado. 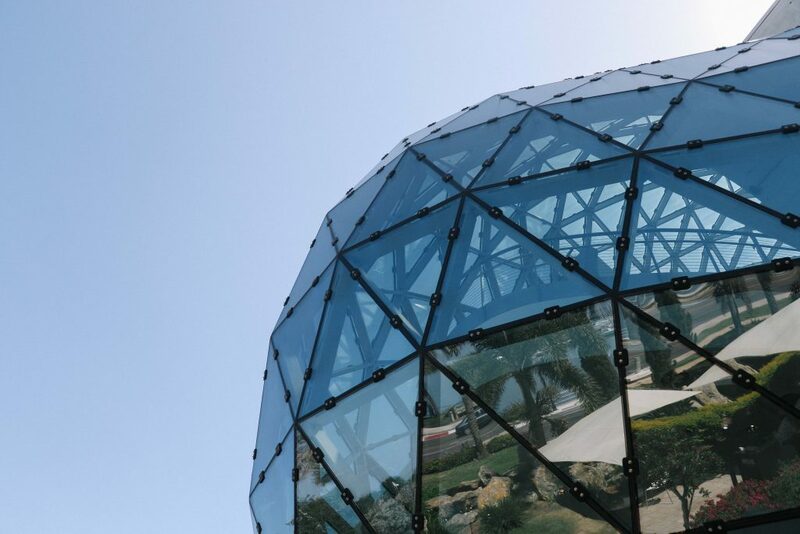 Offering 20,000 feet of gallery space and featuring a giant 75ft geodesic glass atrium, St Pete’s Salvador Dalí Museum was one of the more unexpected highlights of our trip, and a place that regularly tops the list for the best things to do in St Pete, Florida. Taking pride of place on the aptly named Dali Boulevard, the museum is entirely dedicated to Dalí and his curling moustache; a steel sculpture of it hidden in its tropical gardens. 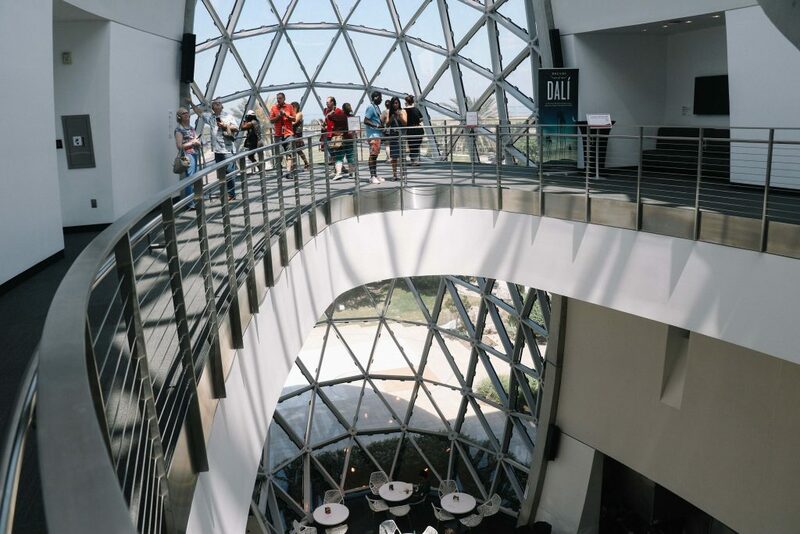 Founded by works collected by Reynolds and Eleanor Morse, the museum houses the largest collection of Dalí’s work outside of Europe, offering an assortment of over 21,000 pieces, alongside a Catalan-inspired café and gift shop. Arranged chronologically, we passed through works, manuscripts, photos and sculptures belonging to Dalí, before exiting to enjoy coffee in the museum’s beautiful gardens. Here, lush tropical flowers and towering palm trees swayed gently in the breeze, each reflected in the museum’s giant atrium. It was an incredibly relaxed and peaceful spot: a place that blended St Pete’s famed tranquility with that unmistakable Catalan culture. 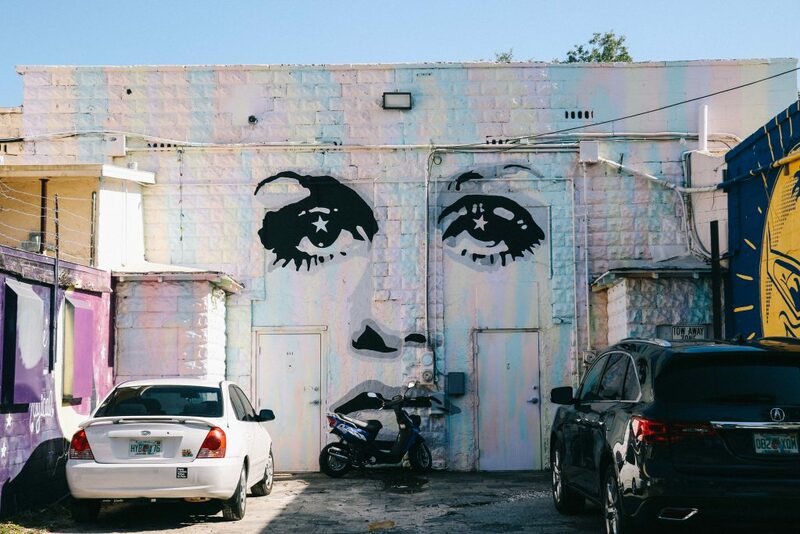 From galleries to street corners: St Pete’s art scene continued. Heading inland towards downtown St Pete, we were told to expect a different sort of art scene: one with fewer hushed commentaries and gaudy moustaches. Having had lunch at Bodega earlier that day – a restaurant in the heart of downtown St Pete – we’d already had a glimpse of this area of the city. It was a place where the sun felt hotter, where the sidewalks were lined with independent boutiques and coffee shops, and where guitar-playing buskers perched on street corners. It was also a place where vibrant street murals decorated walls, rooftops, doors and passages. “You know, we hoped for a developing art scene here for a long time – one that was more grass roots – but nothing happened”, Derek Donnelly, founder of Saint Paint Arts, tells us as we walk behind a cluster of buildings. “So, we decided just to start something ourselves”. 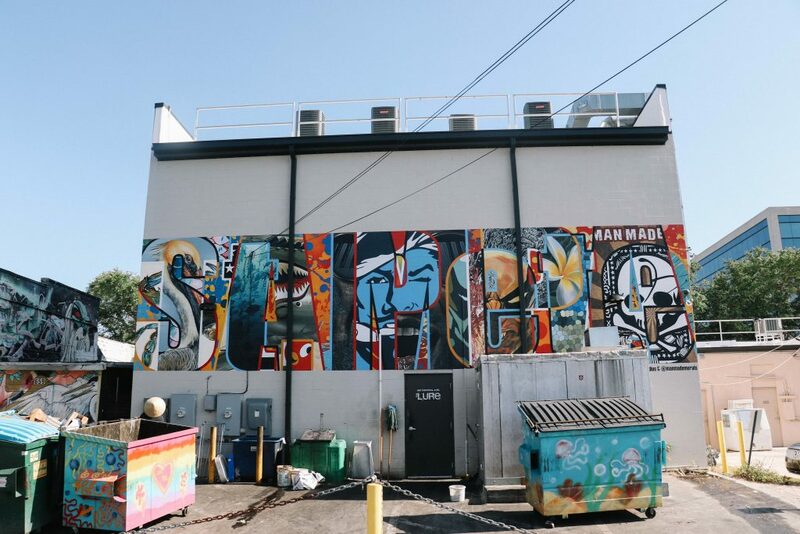 Formed in 2011, Derek began Saint Paint Arts as a collective, featuring a diverse group of local artists and muralists. 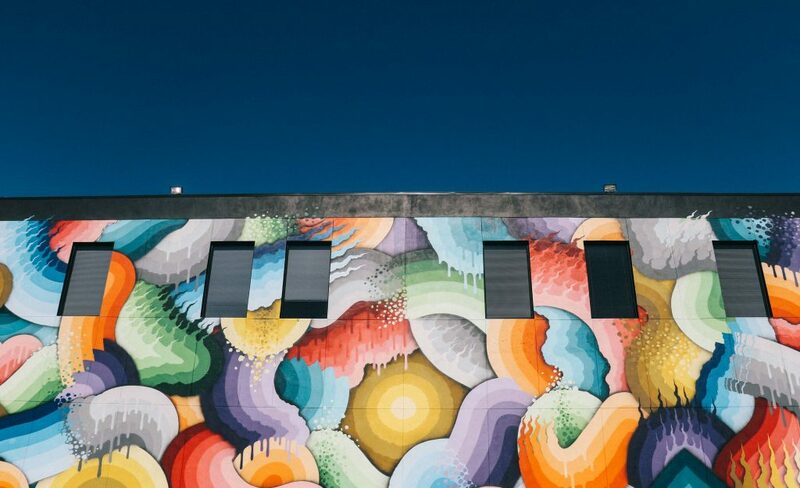 “We just began to speak to store owners and businesses, to see if they’d mind if we could paint or spray murals on the back of their buildings. What was surprising is that lot of them just told us to go for it”. Gathering under a group of trees, Derek gestures to the car park and buildings surrounding us – each decorated in stunning techni-colour. “And now, you know, some of us are paid to do this full time. It’s kind of crazy”. Looking around and I’m not sure where to begin: the entire area a living, breathing gallery. 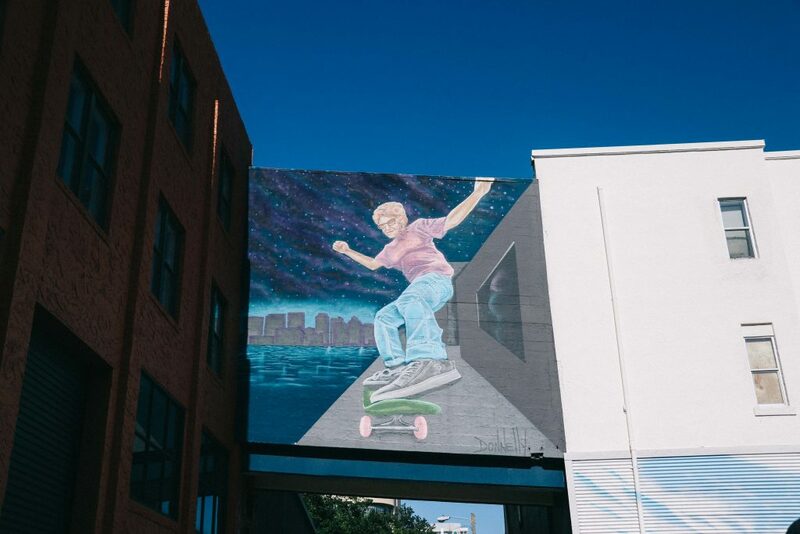 Ahead of us is the city’s now famous Time to Think mural, featuring a corporate businessman embracing his creativity; a jellyfish and starry expanse of universe escaping from his naval. 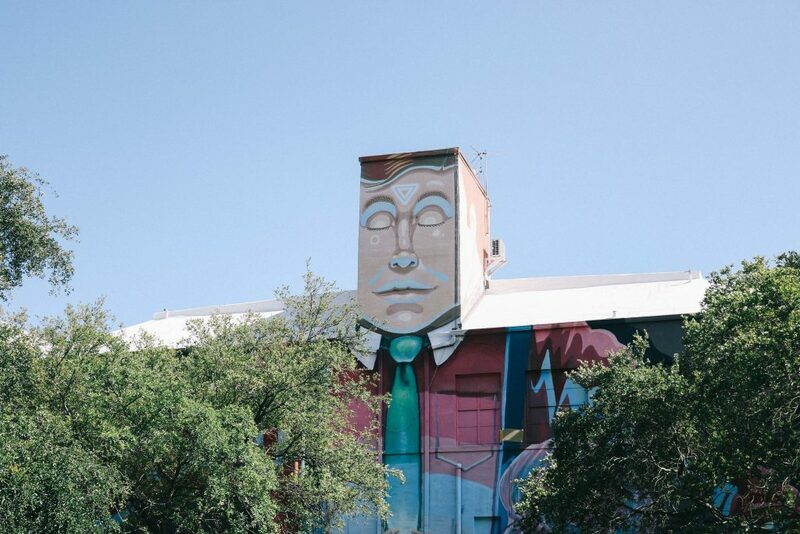 “That’s a nod to the head of Regions Bank who sponsored the mural”, Sebastian Coolidge, fellow St Pete artist and co-creator of the piece, explains. “We wanted to include him in it, as a thanks for getting behind us”. Across the road is more of Derek’s work – a regal look iguana peering out from under a green fringe of plants. Next to him, a smiling sun looks down at us, whilst a wistful looking Twiggy looks skywards. 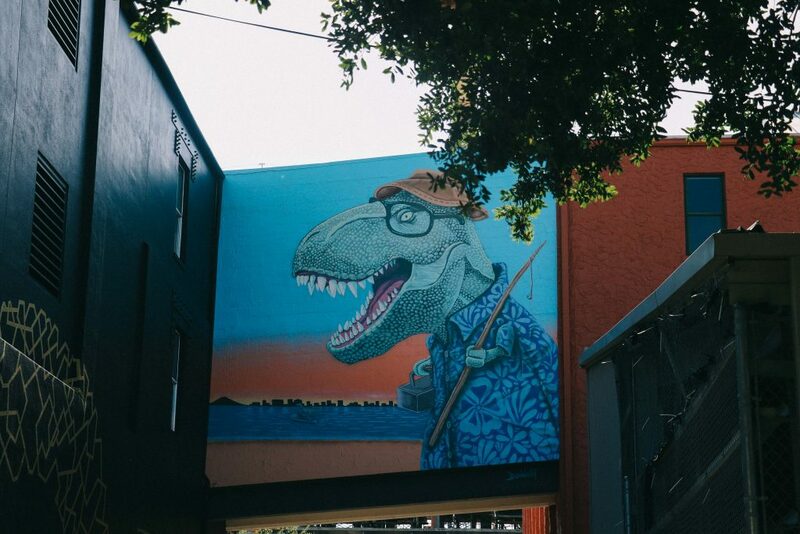 Walking a little further on, passing murals of a spectacle-wearing T-Rex and skateboarding grandma, I ask Derek if St Pete, Florida has always been so dedicated to this brand of creativity – it even has its own street art mural festival, Shine. “Not really. Growing up, this was a place for vacationers or retirees to come, but that’s changed in the last ten years or so. 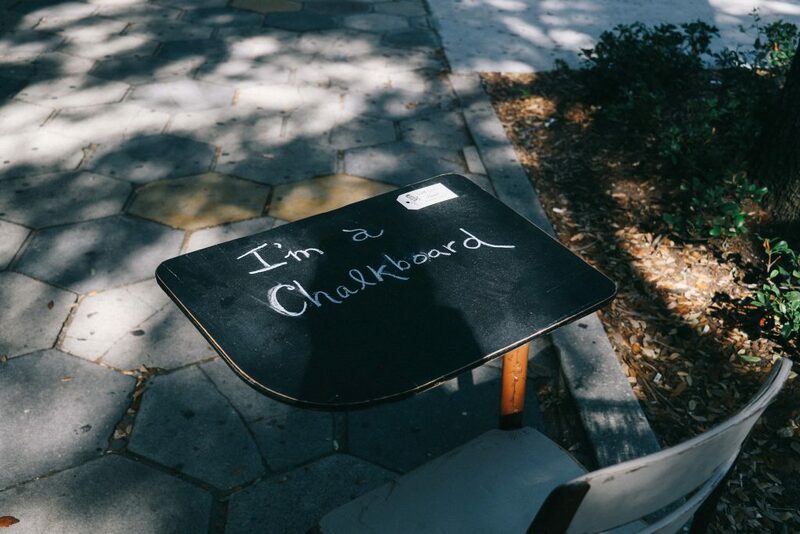 St Pete is a really cool place to be now – especially for young people”. He points to a few bars to visit later, including Intermezzo for happy hour drinks. “As the city’s gotten older, it’s begun to feel younger”, he concludes, poetically. 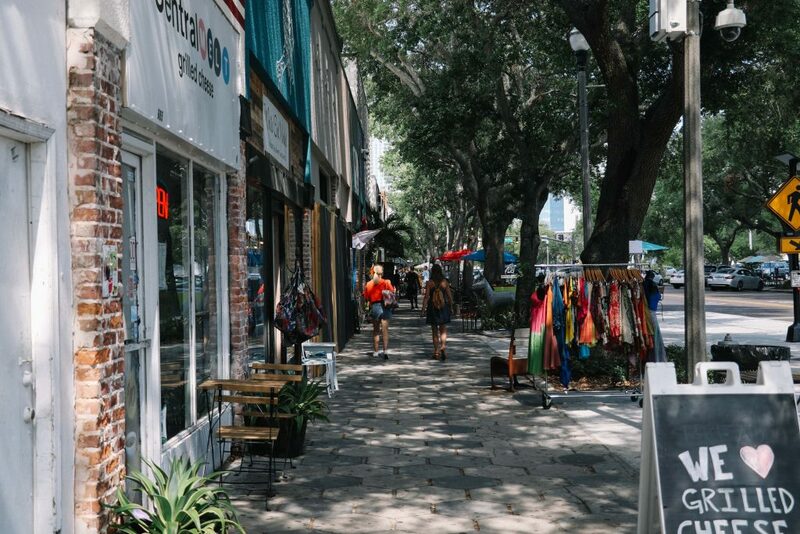 This street tour was easily one of the best things to do in St Pete, Florida. Leaving Derek and Sebastian behind, we walk down streets lined with jasmine plants and pass a group of cyclists heading to yoga; their mats strapped to the back of their bikes. 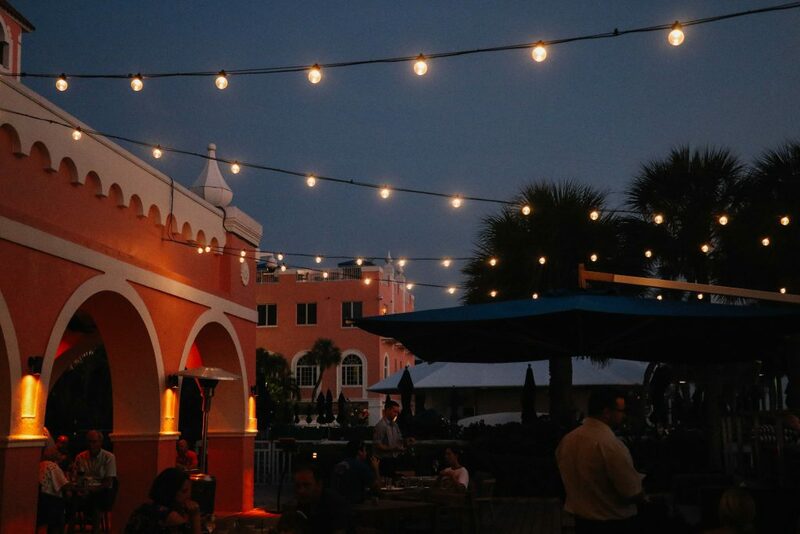 The evening is still hot and the sky is a burnt orange – St Pete residents spilling out of their offices and into the outdoor bars and restaurants. 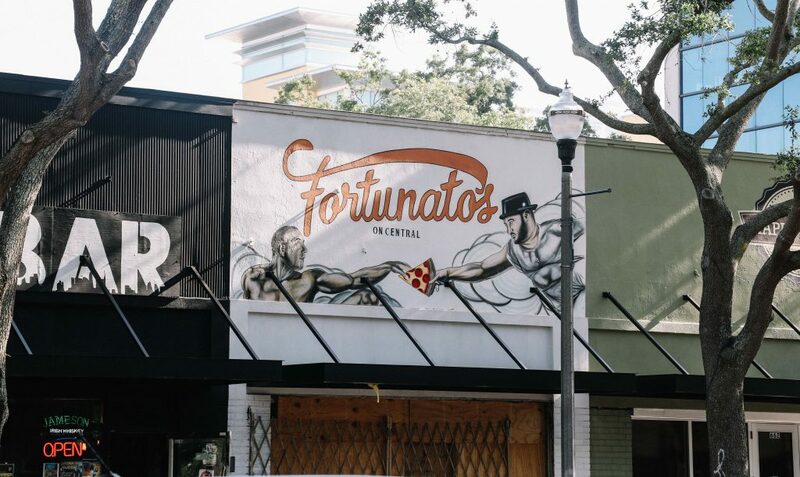 We walk past them, heading to our final stop of our St Pete trip: FarmTable Cucina. An Italian-inspired restaurant, dedicated to locally sourced and seasonal food, Cucina is a popular place to meet for after work drinks and a meal. “You’ve got to try the fried cauliflower starter”, our waitress tells us as we begin to order. “I might be a vegan but it’s the best starter you’ll ever have.” She isn’t wrong. When she returns – our bellies stuffed full of cauliflower of every imaginable colour – I ask her if she finds eating out as a vegan easy in St Pete. “Oh, increasingly so”, she explains. “Please, go to the Kraft Kafe or HaleLife Bakery before you go, and you’ll be able to see for yourselves”. Taking her advice, this is how we end our whirlwind stay in St Pete, Florida: walking down the streets at sunset, a muffin each in hand. Just a few days before, we had done the very same thing in Tampa; a late night trip to Dough enticing us away from our hotel room. It was a visit that already felt a long time ago; as though it took place in a different state entirely. Perhaps Nancy and Buddy had been right: although only a twenty-five minute drive apart, Tampa and St Pete were two very different cities. 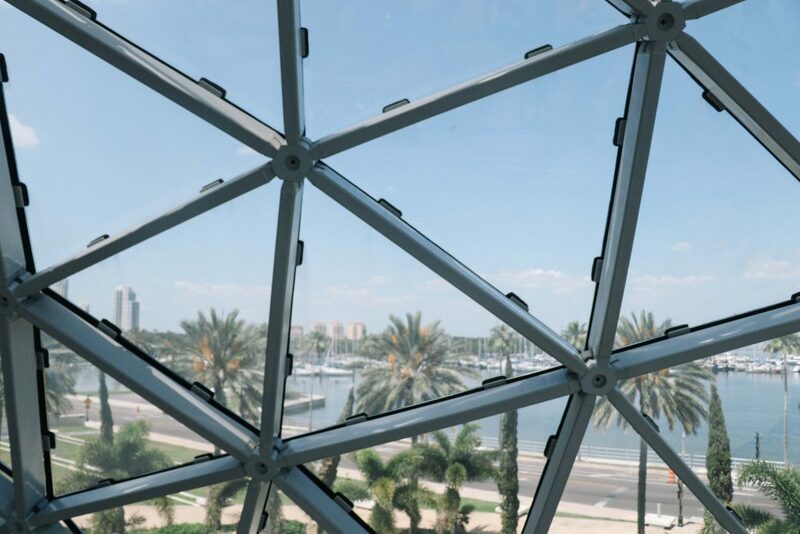 Whilst Tampa had a contagious buzz: a very tangible and deliberate sense of disruption, St Pete seemed more relaxed in its attitude towards change. 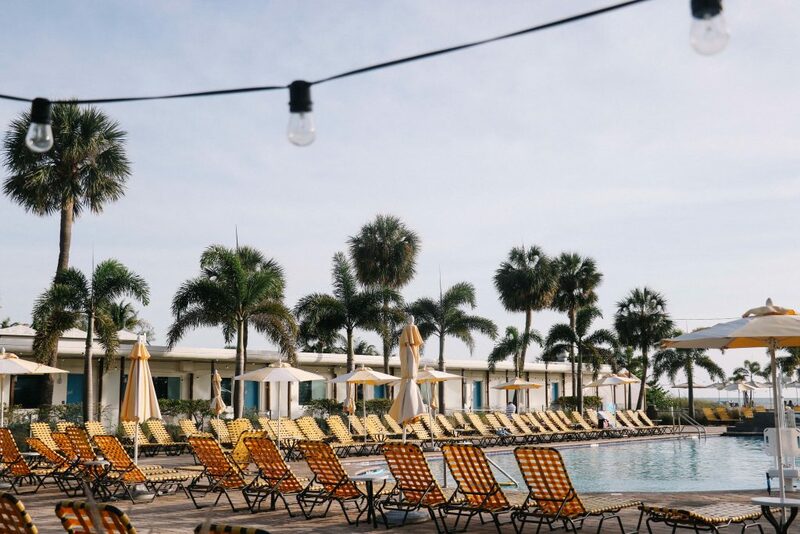 Nostalgic, bohemian and wedded to its past thanks to places such as The Don CeSar Hotel, the city operated at a calmer pace – unhurried in its ambitions to radically transform. Instead, any changes seemed to come gradually and consciously, led by men such as Derek with a spray-paint can and paintbrush in hand. 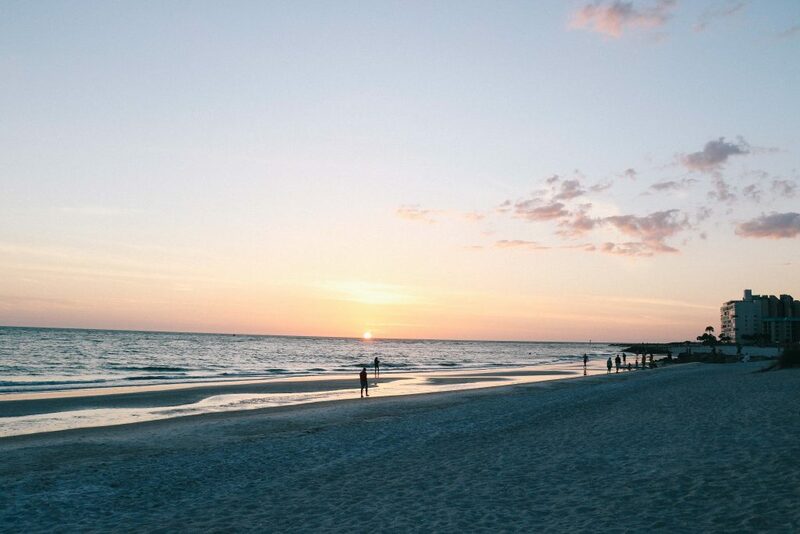 Settling back down into our former motel room for the night – the sun casting its last light over the beach – I decide it’s a pace of life that suits St Pete, Florida very well indeed. Visiting more of Florida? Read our ultimate guide to Florida holidays here. "A Guide to Swimming with Manatees on Crystal River"
"Episode One (Season Two): Our Florida Road Trip"